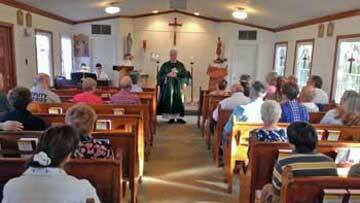 St. Joseph the Worker Catholic Church is a small welcoming faith community, serving the Warren County and Lake Gaston areas. We invite you to join us for communal prayer, adult faith formation and in our outreach to the community. Our church offers qualities you may not find in larger Catholic parishes. We seat about 50 comfortably so our intimate atmosphere creates closeness to God among our parishioners and our community. At St. Joseph the Worker, there is a sense of communal ownership and pride. We have a passion for our faith and make the time to grow our church – and to grow in our faith. Most importantly, we take to heart what our church teaches, that is "the Eucharist is the source and summit of our faith". 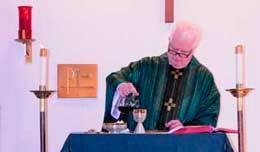 We are committed to all of our liturgical ministry roles including musician, lector, celebrant and homilist to make the Eucharist the special celebration it is supposed to be. Take a look around our website and see our many activities and opportunities to make the Word of God understood and practical in everyday life. Better yet, come join us at Mass and you will see a vibrant and active faith community. Baptism – Please contact the parish secretary at (252) 257-5605, at least one month in advance to schedule preparation. Reconciliation – Communal reconciliation is celebrated during Advent and Lent. Please see the church calendar for specific dates and times. For other time please contact Father John at (252) 438-3124. Marriage – Please make an appointment with Father John at least six months prior to your desired date to schedule the church for your ceremony and begin marriage preparation. Please contact the parish secretary at (252) 257-5605 for more information. Anointing of the Sick – Anyone anticipating surgery, is ill, injured or weakened due to illness or age is encouraged to receive the Anointing of the Sick. Call Father John at (252) 438-3124. VANCO On-line Giving Company securely manages online giving financial assistance to churches throughout North Carolina. Would your be interested? Pope Francis Calls for a "Politics of Nonviolence"